The Banks That Get 88,000 Cr. as a Bailout. Explained. On October 25, 2017 the Government announced the Great Indian Bank Recapitalization program. (Read our post on it) The idea was to infuse capital for ailing Public Sector Banks which under the heavy burden of Non Performing Assets had been having a tough time. The government is the “promoter” of public sector banks, and has been accused of using political pressure to force these banks to lend to “shady” borrowers, many of whom have defaulted now. And who will buy these bonds? That’s the best part. We’ll come to that later. While the financial crisis in 2008 mauled Banks in the United States, India didn’t face a crisis and that has enabled banks to come out with little or no damage. But bad behavior never goes unpunished and as India started to slow down on growth, Infrastructure companies, Energy, Metal and other commodity related companies started to experience pain points the likes of which many hadn’t come across in their lifetimes. While 2005 – 2010 was all about expanding their horizons thanks to the easy money, 2010 – 2015 was a battle for survival with many unable to pay back what they had borrowed thanks to the sudden change in the environment. Of course, public sector banks either refused to recognize the defaults, or just “evergreened” them through innovative means. 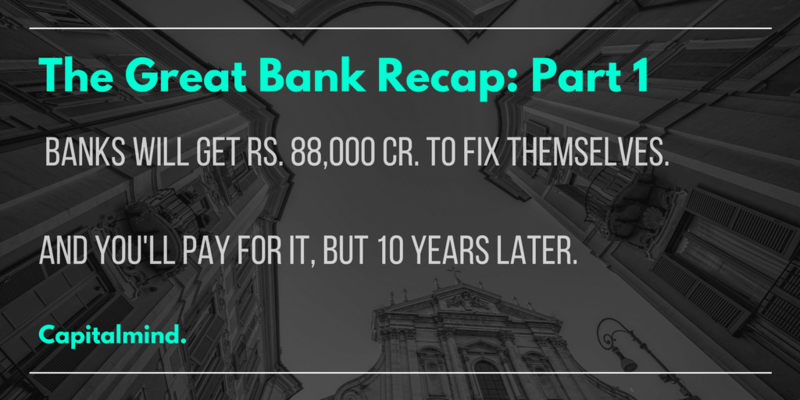 And asked for RBI forbearance, restructuring, a 5:25 plan, and extended write-off periods. Come Raghuram Rajan and many such ways went for a toss as he pushed harder for the banks to take the hit. In his words, what the Banks required was “Deep Surgery” that would clean their Balance sheets and help them in future growth. Banks could try to take the hit now, but their capital ratios will go horribly down. Here’s an example. 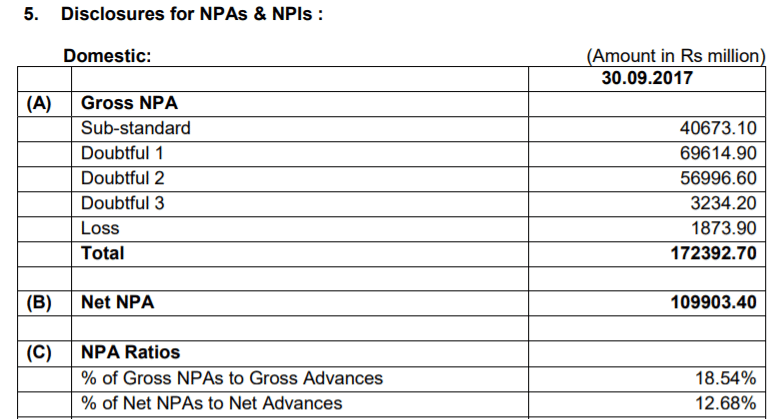 Bank of Maharashtra has ludicrous quantities of NPAs. Over 17,000 cr. of them. Of them more than 6,000 cr. are more than Doubtful 2, meaning, they’ve been NPAs for over 1 year. Now the bank is SUPPOSED to provision 40% of doubtful assets. But in the bank’s admission it’s provision coverage ratio is 50% – so they have only provisioned for HALF of what they should have, which is only 40% of the entire doubtful loans. In effect, they probably have provisioned just Rs. 1200 cr. of the Doubtful 2+ loans. So if they “take the hit” they’ll probably have to write off, say, 75% of the Doubtful 2+ portfolio – meaning about 4500 cr. I know this is extreme, but that’s how it tends to be. Out of this 4500 cr. lost, the bank has only provisioned around 1200 cr. so they have to lose another 3300 cr. Their entire Tier 1 Capital is 6000 cr. If you take a 3300 cr. loss, you’re left with a bank that only has 2700 cr. in capital, and now, massive NPAs (11,000 cr.+) still remaining. So someone has to pump in capital. Private parties won’t. So the government must. This is huge for a few banks. Some, like Canara Bank, will see a 23% dilution. Meaning, new shares will be issued that will increase the number of shares by 23%. Some will hurt a lot more. UCO Bank, Bank of Maharashtra and Dena Bank (and nearly so, United Bank) see a doubling of their equity base. In 12 banks, the government ownership will end up being beyond the 75% limit set by SEBI for promoter ownership. Worse, because they have just been issued shares, the government can’t sell any shares for another 6 months. Take the case of Bank of Maharashtra above. It’s getting about Rs. 3173 cr. But it’s Doubtful 2+ assets are a ludicrous 6000+ cr. Which means, once these assets take the real hit, the capital requirement will quickly come back (and more NPAs will happen). All the big accounts above (More than 500 cr.) have seen recoveries of less than 50%. 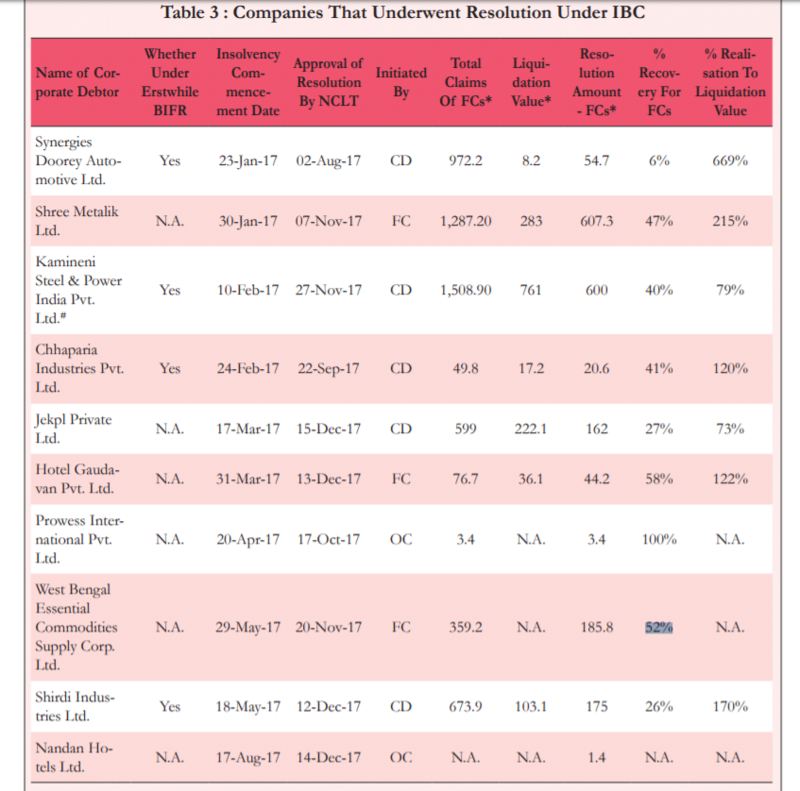 In the current large set of recoveries, a Monnet Ispat has seen bids of around 25% to 30% of assets. In such cases, the 50% provisioning for Doubtful assets with NCLT is no longer sufficient. Banks will take a greater hit. And they’re going to come back for more capital. Will Something Change for the future? No heads are rolling in the banks. No one will be fired. There is simply no incentive to curb the kind of bad lending that led to this in the first place. Each bank will create a Stressed Asset Management Vertical (which probably needs to contain the financial equivalent of thugs for recovery) and move all the bad loan management there. Banks to sell all non-operational related real estate and ownership in companies. The hope is that something will change. In the spirit of hope, let’s also believe this will happen. Who Pays For The Bailout? Currently, of course, the government will issue bonds. These bonds will be bought by the bank itself. Then, the government will buy shares. And give that cash back to the bank in exchange for those shares. It’s like the bank is paying for its own shares, but that’s not true. The bank is owed money by the govt. Which can pay back perhaps in 10 years. It will have to pay interest too, which is likely to be around 7.5% if it’s a 10 year bond. And 10 years later, the government has to pay back principal. The banks will hold the bonds on their books and their capital ratios will improve. Because now they have more capital as a percentage of their total assets and can take a little bit of a loss. These bonds are not likely to qualify for SLR. (A ratio that specifies how much govt debt banks must compulsorily own) And it’s quite likely the RBI won’t allow the banks to sell them either. They’ll sit like a horrible weight on the bank books until they are redeemed. And if they are tradeable without being SLR, their prices will crash. Because no one else will want it. So basically the payment currently comes from the banks, for the bonds. Eventually taxpayers will pay back the principal. This is needed. It stinks, but without this we have only zombie banks. I don’t think we want to see deposit failures, but some bond holders should have been made to take some losses, and for them to reduce the moral hazard. And heads should have rolled. But what we have is potentially more zombieness if banks won’t take the hit. And good banks like Indian bank (which didn’t get a bailout because it’s ratios are great) aren’t getting any push either. So what’s the incentive for banks to perform? They’ll continue with the bad loans unless there is a stick along with this carrot. Having said that, this has to happen. It will widen the fiscal deficit even if they pretend it won’t. It will help these banks take big losses, and I really hope they have the temerity to take them, rather than push the can even further down the road. And yes, I hope they use technology to monitor the loans AFTER they have given them. These are massive banks. 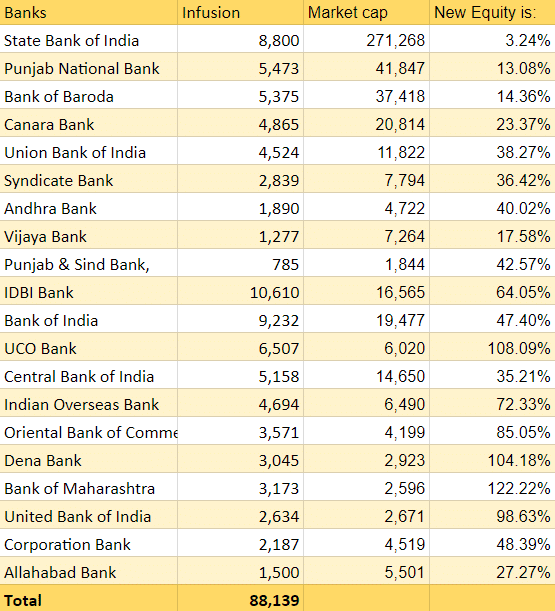 PSBs are 70% of the banking system. They have the ability to change a lot about banking, and if dynamism is promoted from the inside, we could see great things happen. There will be a part 2 of this bailout. Let’s wait for that to build a better report card.